Indo-Western clothing label Namakh has now set up shop on New BEL Road and has a little something for everyone who walks in through their doors. Different from their online platform, the Namakh Store and Cafe is now a collaboration of small, independent distributors of clothes, accessories and, home decor and artwork. With kitschy products and clothes along one side and a cafe on the other, the store has an indoor flea market vibe. Conceptualised by Anirban Chakraborty, Debashish Chakraborty and Diptarka Ghosh the store aims to bring fashion, food and, events all under one roof. All you office fashionistas who want quirky office clothes (without a visit from HR for dress code violations!) should check out Ridhani that makes bespoke Indo-Western work wear. Select your design and fabric, customise your style and book a consultation with the design team and they’ll customise it to your preferences. Complete the look with bags from Meraki and statement jewellery from Rustic Trunk (that also makes bags and home decor inspired by ethnic designs). Exclusive pieces your thing? The label Ritansha curates fashion with material sourced directly from regional artisans all across the country, so your outfit is one of a kind. 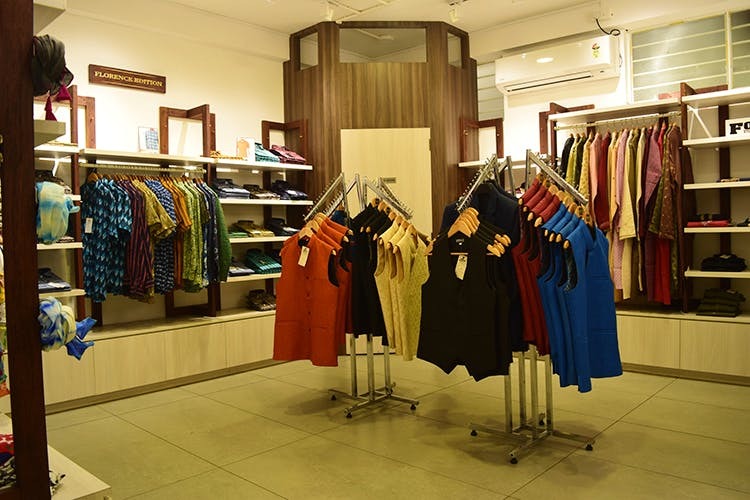 Namakh’s loyal customers can also browse through their favourite styles at the brand’s section in store. Men who enjoy the Indo-Western style can shop at Florence Edition for smart casual shirts in funky prints and comfy fits at affordable prices. They’ve also got you covered if you’re looking for ethnic formal wear including bandhgala jackets and coats at Formale. Fashion forward parents of toddlers should check out Snowflake and Bota-Bota that cater specifically to toddlers and kids. Art junkies looking to add to their collection can find their next addition by the inhouse artist and, from Art On Wood (we think the name is pretty self-explanatory) that sells coasters, fridge magnets and cutesy signs for your home. Grab a snack and drink flea market style (With more solid food of course) be it lime soda or pancakes. Their menu is still at testing stage, so don’t be surprised if what is available is different from what’s on the menu. You also have the option of working out of there as they’re going to be introducing work stations for nominal rates.